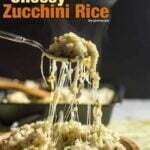 Cheesy Zucchini Rice is a one pot side dish that is amazingly tasty. It is wonderfully creamy and divinely cheesy. This is such a great zucchini recipe that kids (and your carnivorous husband) will never know that they are eating a bunch of zucchini; they will think that they are eating rice with lots of cheese. So you don’t need to spend a lot of time trying to convince them how healthy zucchini is. Just make sure you have enough of this so that you can give when they ask for the second or the third. I love to combine zucchini with cheese, they always make a good couple. One of our favorite way of eating zucchini is this three-ingredient very Easy Cheesy Zucchini in pan, which is another great side. Adding rice into that combo, you end up with that creamy and satisfying Cheesy Zucchini Rice. If you follow a vegan diet, you can just leave the cheese out; it’s still tasty but may not be that creamy. Rice is cooked just in the regular way; sauteed in heated butter or olive oil, water is added and then simmered over the lowest heat until it absorbs almost all the water. Then grated zucchini is added and cooked for some more minutes until the zucchini loses rawness. I added a little extra zucchini after it is removed from heat to make nice green spots, but we didn’t like it as it was bitter. Maybe it was the type of the zucchini I used because we occasionally eat zucchini raw as in these Raw Zucchini Rolls. So taste your zucchini first to see if there is any bitterness before adding it into the rice raw. I add a mixture of mozzarella and feta right after it is removed from heat, cover and let it rest until the cheese melts and reaches to that heavenly stretching texture. You can replace the cheeses with your favorite ones. I’ve seen several cheesy zucchini rice recipes on the web that use sharp cheddar, so you might consider using it too.Check out Cheesy Zucchini Rice at Pink Parsley for a different version with cheddar. I don’t think you will have leftovers, but if you happen to have some, add in a little milk into it and then heat it up covered over the lowest heat. I don’t recommend it cold. This cheesy zucchini rice is like a casserole over stove, but cooks quicker. I love this side since it’s easy to make, so it’s a great option for those weekdays when you come home after a busy work day. It’s a risk-free zucchini side, you know that everyone in the family will love it. And knowing that you won’t hear sentences like “I hate zucchini!” is such a great feeling. I’m 100% sure that this will become one of the top favorite sides of your family. Creamy zucchini rice loaded with cheese. The perfect summer side dish. Heat butter in a medium pan. Saute finely chopped onion in it over medium high heat. Add in rice, lime juice, salt and pepper and cook over medium low heat stirring continually to prevent it from sticking, for about 3 minutes. Pour hot water over it and bring it to boil. When it starts boiling, cover and continue cooking it over the lowest heat until it absorbs almost all the water; for about 20 minutes. Stir in grated zucchini and cook for another 10 minutes over the lowest heat until zucchini is tender and loses its bitterness. Remove from heat, fold in cheese and let it rest covered for 5-10 minutes until the cheese melts. Serve it hot when the cheese is still stretching. If you have any leftovers, just pour a little milk into it and heat it up before serving.